Category: Ilco Part, Kaba ILCO, Key Machines. Tags: Featured. The Silca Futura Pro is innovative electronic key cutting machine for Laser-Cut, Edge-Cut, Cruciform and Dimple keys. Comparing to its predecessor the Futura, the Futura Pro features signature dual cutting stations, faster cutting and improved software. 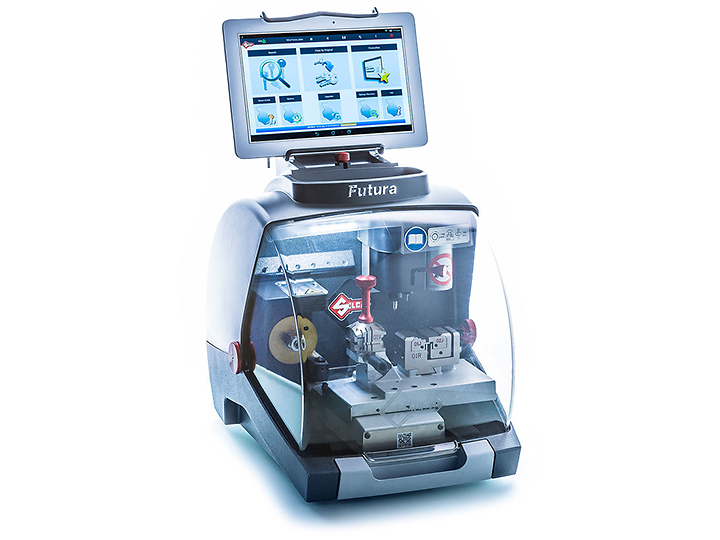 The Futura Pro with step-by-step prompts on the touch screen throughout the cutting processes can be used by both professional key cutters and also less experienced users. This amazing machine has an ultra modern design; engineered to the highest quality standards. You can be assured of the most accurate and precise cutting of different key styles. • Guided calibration of the cutting station. • Ergonomic clamp handle to easily tighten the key securely in place. • Automotive keys and most residential keys cut in one smooth pass. • Expand capabilities to include Tibbe®, tubular and other keys with optional accessories. Lead time on Key machines is approximately 2 weeks. If you are looking for a specific Ilco item on OfficeKeys.ca and do not find it listed on our site, please feel free to inquire on the availability of what you are seeking to support@officekeys.ca We can quote and order it in for you. Leasing is available on Key machines. Please contact Nadine Harding @ Mayo and associates 416-292-4771 or email nharding@mayo-associates.com The link to Mayo & Associates for any information related to leasing. OfficeKeys.ca also offers a 3 payment plan for the purchase of Key Machines. Contact us for details.